THE STORY At Rodney Strong Vineyards is that they focus on modern artisan winemaking, exclusively from Sonoma County, California. Our family-owned winery is committed to quality wines and to protecting resources for the future. They practice sustainable and Fish Friendly Farming and are Sonoma County’s first carbon neutral winery. HISTORY Rod Strong established their heritage Sauvignon Blanc vineyard in 1971, naming it Charlotte’s Home in honor of his wife. Today that vineyard remains the core of Charlotte’s Home Sauvignon Blanc, along with other select estate vineyards in the Alexander Valley as well as the Russian River Valley. THE VINEYARDS 2013 was the kind of growing season that most would wish they could have every year: a dry, frost-free spring, a warm summer without heat spikes, and a warm rain free autumn that allows for picking all varieties in their turn when they are perfectly mature. This Sauvignon Blanc was harvested from vineyards in Russian River Valley and Alexander Valley between August 21st and September 17th. 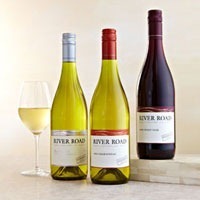 TASTING NOTES Light, crisp, and highly aromatic, the warmer climate Alexander Valley fruit gives this wine ripe peach, tangerine, and pineapple character, while the ocean cooled Russian River Valley fruit offers citrus, lemon grass, and slightly herbaceous qualities. Together, the two valleys make a classic Sonoma County Sauvignon Blanc that is fresh, lively, and will drink beautifully over the next 1 to 2 years. Delicious to quaff, it supports seafood, chicken, creamy cheeses and nuts to perfection. producing fine wines since 1970. Citrus aromas upfront with added notes of gooseberry and lemon zest. mouth with tropical notes mid-palate of passion fruit and more pineapple. Nectarines and a touch of basil in the finish. Great with seafood, nuts a, goat cheese. The 2009 vintage marked the beginning of a new challenge for the vineyard. A cold and wet spring delayed the onset of bud break in many of our vineyards, and these conditions necessitated a later than normal harvest for our Petite Sirah. The extended hang time brought us precariously close to winter rains, but allowed for full development of flavors and an opportunity to harvest at optimum physical maturity. Petite Sirah grapes create a dreamy opportunity for winemakers, with steady, low heat fermentations that always seem to finish easily and at moderate alcohols. This wine was no exception, a near perfect fermentation created a clean expression of fruit and tannin. These pure flavors allowed us to experiment with different levels of toasting in the barrel ageing process; by utilizing a slightly higher amount of heavy toasted oak, the tannins were rounded and softened to create a unique expression of our vineyard. Rich, deep purple in the glass, with aromas of lavender and dark fruit balanced by meaty, earthy undertones. This wine bucks the stereotype of Petite Sirah being all finish and no flavor, and really begins to shine after an hour of decanting, revealing luscious aromas of fruit, cocoa, tobacco and a hint of molasses. The finish is strong but not abrupt, giving you the desired “oomph” of a Petite Sirah without being dry or abrasive. A truly delicious wine that will only get better with time. The perfect dinner wine. We loved this elegant, food friendly P.S. with roasts, pasta, cheese and just about anything. A real surprise. company, located in Russian River Valley’s sub appellation of Green Valley. They offer a tremendous value experience through our commitment to producing wines of the highest quality, yet offering them to the public at the most affordable of prices. Family Vineyards and Winery offers distinctive wine styles, and embodies the character and versatility of each region and vineyard. fermented, this Sonoma County Chardonnay is a classic everyday Chard. We are fans of the Un-Oaked style and this is a charmer. The balance is the secret. Excellent! wine, this vibrant Reserve Pinot Noir has a beautiful depth of color. Not your standard Pinot Noir. Real elegance. Love it with turkey. $26 suggested retail, here is a wine that drinks like “over $50” and (with some breathing) is ready to enjoy with meats, game, chicken, cheese and fancy meals, as well as a hearty pasta or meatloaf. The grapes for this vintage were hand picked and sorted for quality in the vineyard. The fruit was fermented in small stainless steel tanks and bins. Over four days, the must was allowed to “cold soak” to extract color and flavor prior to the start of fermentation. Pumpovers and punch-downs took place frequently over a ten-day period before the juice was pressed off and transferred to French oak barrels (40% new) to complete malolactic fermentation. The final blend was chosen after numerous tasting sessions. The Jardine Petite Sirah contributes dense, dark fruit with great tannin structure. The Creston Valley Vineyard adds touches of minerality, while Huerhuero adds dark color, fresh berry aromas and spicy characteristics. A percentage of Syrah from Cammatta Hills brings flesh and body to the blend. Together, they create a wine displaying complexity, structure and balance.